Libraries and books always have the power to bring people together…another reason why I love them. Over the past few days, I’ve come across two international projects that are very good examples of this. During my latest trip to London, I saw a book maze designed and built by the Brazilian artists Marcos Saboya and Gualter Pupo at the Royal Festival Hall as part of the Southbank Centre. I often spend time here reading, thinking, writing and typing when I’m in London as it’s in a great location and is such a multipurpose venue. 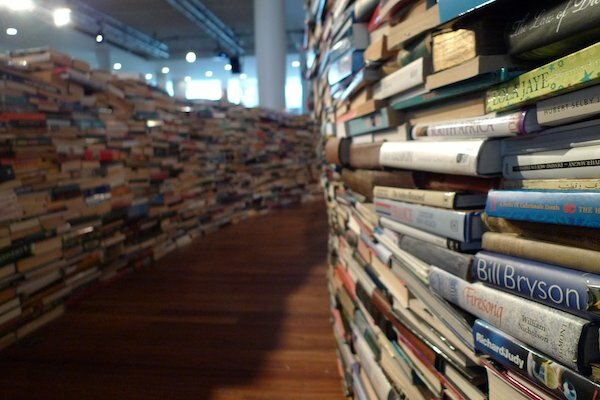 Entitled ‘aMAZEme’, programmed as part of the arts festival for the London 2012 Olympics, it is a stacked, twisting labyrinth of books based on a fingerprint belonging to writer Jorge Luis Borges. It was built by the artists and over fifty volunteers day and night for five days using 250,000 remaindered, used and new books, most of which are on loan from Oxfam and will be returned after the exhibit. The piece covers over 500 square metres with sections standing up to 2.5 metres high. Below is a time-lapse video of the building process that gives you a real sense of how the installation was constructed. On the very busy Olympic “super Saturday”, the maze was busy, full of people negotiating the paper walls that guided their path, full of children reading and playing, and most of all full of people reading, learning and engaging with words. I was caught at one stage taking breaths between the pages, getting a smile or two from members of the public as if they also did the same ritualistic action when picking up a book for the first time. I’ll talk about the smell of fresh print tomorrow.